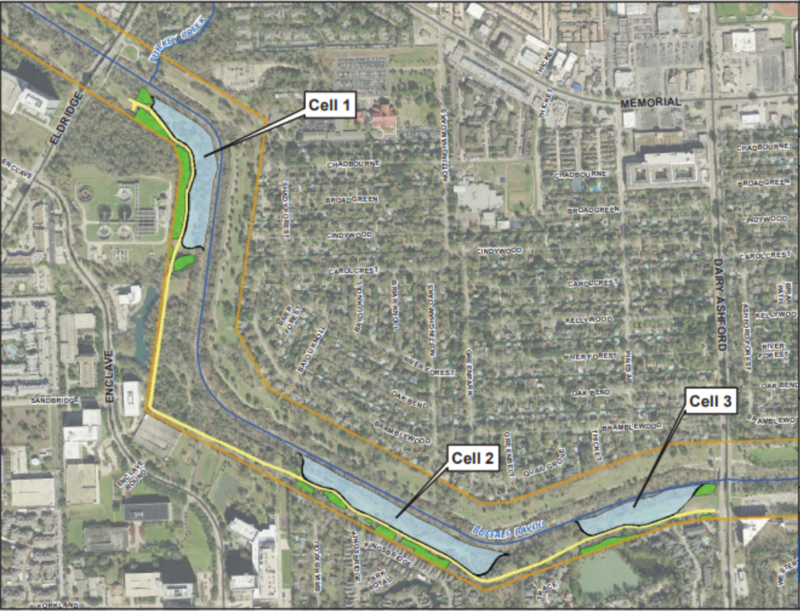 The Harris County Flood Control District has notified residents living on upper Buffalo Bayou in west Houston that construction of controversial stormwater detention basins on the forested south bank will begin soon. The district sent an email, including a flyer about the project, to neighborhood leaders last Thursday, Jan. 24, asking them to spread the word that construction would begin in late January on three initial basins between Eldridge Parkway and Dairy-Ashford Road. 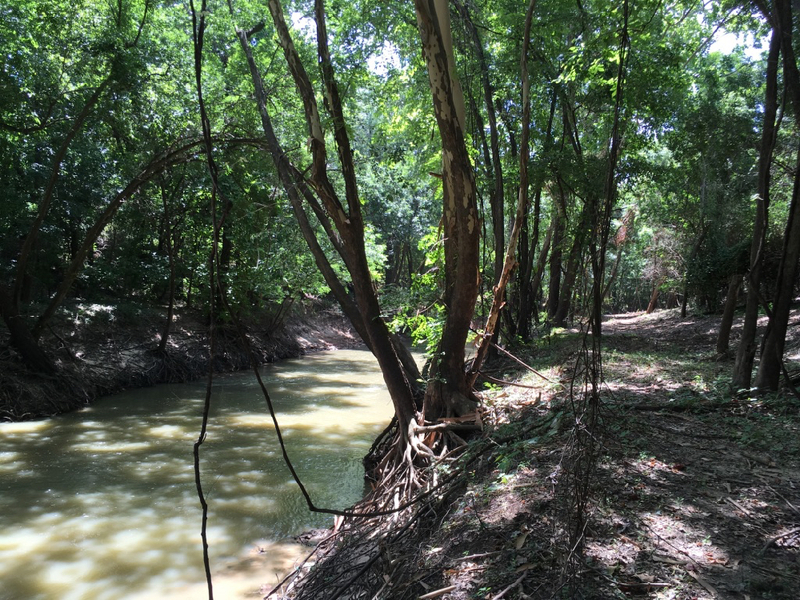 The shallow linear detention basins require the clearing of trees and vegetation near the bank of the bayou. They would capture and temporarily hold about 100-acre feet of overflow from the bayou during a storm. The district says in the flyer that it will attempt to preserve some trees and vegetation between the basins and neighboring property as well as along the water’s edge. The district owns some 500 acres of land along the bayou for a little over six miles below Barker and Addicks dams. The bayou there was stripped and straightened by the Corps of Engineers in the late Forties. An analysis by Save Buffalo Bayou showed that straightening and narrowing the bayou there actually reduced its capacity, making future residents more vulnerable to flooding. At the time, the land—other than the natural riparian forest along the banks of the meandering bayou—was mostly agricultural. Trees grew back, and the flood control district purchased the land from the Corps in the Sixties, leased it in the Nineties to Harris County for a public park named after environmentalist Terry Hershey, and began stripping trees again on the north bank for linear detention basins similar to those planned on the south bank. In the meantime, trails through the south bank woods became popular with hikers and bikers, and by 2012 local residents had formed a committee called Save Our Forest to fight plans to remove forest and excavate detention basins there. Save Our Forest was largely successful until Harvey, after which the district revived its plans for a series of linear basins temporarily holding some 280 acre-feet of bayou overflow on the south bank between Highway 6 and Beltway 8. In line with modern practice, Save Buffalo Bayou is in favor of slowing and holding stormwater before it floods a stream, not after. A better, more effective, less expensive approach would be to allow the bayou to restore its natural meanders, naturally lengthening and increasing the capacity of the stream, which is what it will keep trying to do anyway, eating away at the banks long ago weakened by artificial straightening as well as by ongoing digging and compressing by heavy equipment. Instead the county and the district spend millions repairing the unstable channel in order to keep it straight. The district has already spent millions on the south bank linear detention basin project, including paying engineering firms for vegetation surveys and design. Lecon, Inc. has the $1.8 million contract to construct the initial basins scheduled to begin any day now. The year 2018 was a year of adjustment and recovery for a city wounded physically and psychologically by the long-lasting impact of Hurricane Harvey in mid-2017. But outdated flood management policy and practice remained in place. The rest of the world is adopting enlightened, practical, and cost-effective ideas like slowing the flow of stormwater (rather than speeding it up), getting out of the way of flooding, and managing flooding in place—practices based on understanding and mimicking nature. But misguided assumptions about streams and drainage—based on faith in heavy engineering and concrete—continue to circulate locally. SBB spent the year following Harvey trying to explain science-based flood and stream management to distraught homeowners and panicked politicians: how rivers work, why they flood, and why straightening, deepening, and widening the entire length of the bayou (and the rest of our streams) would not work and would not help, and in fact would only make things worse. Shocker! Save Buffalo Bayou finds itself defending the Army Corps of Engineers which announces a project, called the Metropolitan Houston Regional Watershed Assessment, to study the big picture of drainage and flooding in the Houston region: where raindrops fall, how they move across rooftops and pavement and land, through drain pipes and into our bayous and streams, and ultimately into Galveston Bay. We need to be talking about this. At the same time Save Buffalo Bayou continues its defense of forests on the bayou, opposing questionable Harris County Flood Control District plans to rip out trees in Terry Hershey Park to create a series of detention basins along the channel for holding a small amount of overflow from the bayou in exchange for allowing the City to send more water into the bayou. Result: So far the detention basins have not happened, though they are still a threat. (See below.) But for now we still have soothing trees to hug and thank for deflecting, slowing, and absorbing the rain and for holding the bayou banks together, among other vital functions. SBB is in favor of detention. Slow the flow! But it makes no sense to cut down trees to create detention, since trees serve as natural detention devices. Details of Memorial Park PGA Golf Agreement: Unanswered Questions. Who Benefits. Lack of Public Involvement. Update March 28, 2019. The City Legal Department forwarded today the decision by Attorney General Ken Paxton supporting the Mayor’s Office denial of our Public Information request for details of the golf course plan. Regarding the agreement to transform the Memorial Park golf course into a PGA Tour golf course and hold an annual tournament there, I remain concerned about the financial benefit to the people of Houston and the lack of public involvement in this decision. Houston is severely lacking in public park and green space. According to a 2018 report from the Trust for Public land, spending on public parks in Houston is about half the national median expenditure per resident. Houston ranks 77 out of the 100 largest cities in the country for park access and amenities, receiving an overall park score of 37.5 out of 100. These figures are no doubt well known to you. But it’s not just a matter of park equity for Houstonians. Our city has been suffering from severe flooding and likely will experience increased flooding. Trees, vegetation, green space are vital for slowing and absorbing the rainfall and runoff that rapidly overwhelms our drainage system, including our streams and reservoirs. Not to mention the role of trees and green space in absorbing carbon dioxide. A $1 million donation to the city parks department, as proposed by Council Member Laster, is an improvement to the proposed agreement. But what percentage of the tournament revenue is that? How much profit will the Astros Golf Foundation and the PGA Tour be making from this tournament in our great public park? We don’t know. Maybe it’s a generous donation. Maybe not. The PGA Tour, as noted previously, reports revenues of over $1 billion annually. Yes, both organizations give money to charities of their choosing (and making). But if it’s our public park being used to make money, why shouldn’t we get to choose? Shouldn’t more of the revenue be directed towards our public parks generally? The parks department and our city council representatives should decide where the money should go – and more money should go towards more green space. We have been told very little about the financial details of this agreement because there have been virtually no public meetings about it. I have previously complained that this change in use of public parkland requires public notice and a public hearing under state law, specifically Ch. 26 of the Texas Parks and Wildlife Code. This complaint has been ignored. Will local people be hired to do the work building the stands, running the event, etc.? Or will the PGA Tour bring in its own people from outside the area? No one has asked the people of Houston whether they want this golf tournament in our lovely forested park on Buffalo Bayou. Maybe they do. We don’t know. 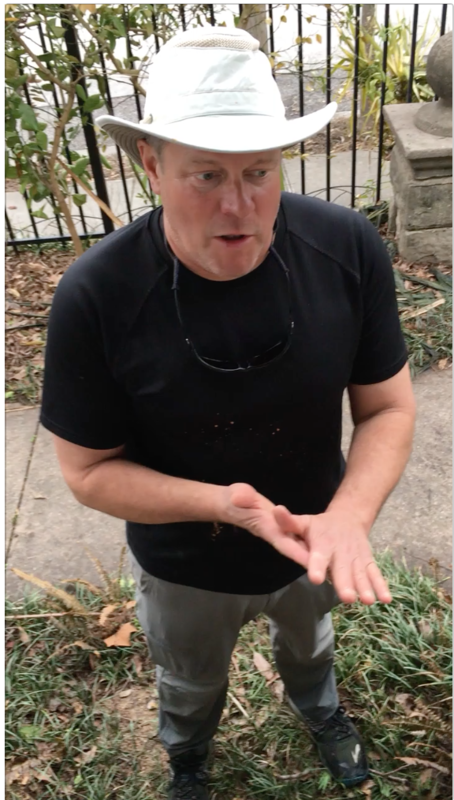 I urge you, please, to ask more questions at your council meeting on Wednesday, Jan. 9.